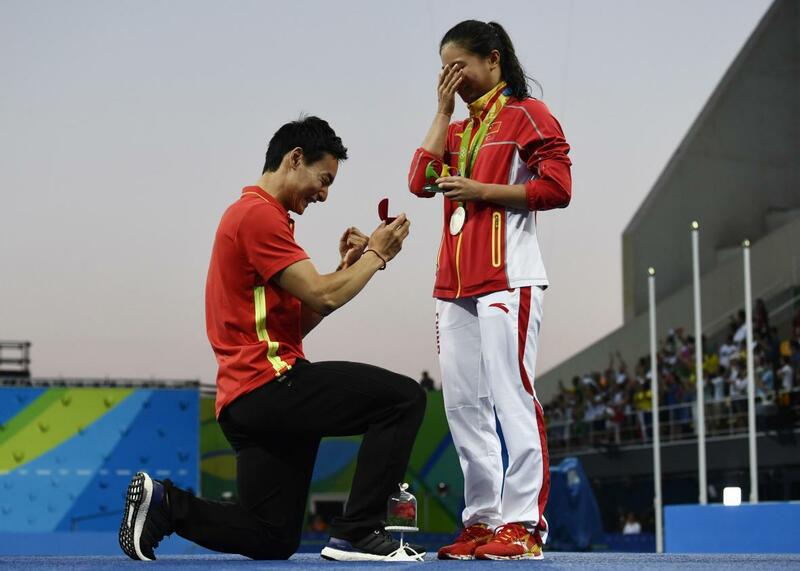 For Olympic diver He Zi, is a marriage proposal an “even bigger prize” than a silver medal? For an Olympic Diver, Is a Marriage Proposal an “Even Bigger Prize” Than a Silver Medal? Chinese diver He Zi accepts a marriage proposal from fellow diver Qin Kai during her silver-medal podium ceremony at the Rio 2016 Olympic Games on August 14, 2016. How great is getting engaged? Is it better than winning a gold medal? What about a silver one? The BBC is catching flak for trying to answer that question for Chinese diver He Zi, who accepted a marriage proposal from her boyfriend on Sunday night at the Rio Olympics. Fellow Chinese diver Qin Kai popped the question just after He accepted her silver medal for the 3-meter springboard diving event. According to Jezebel, in an article about the event (which was broadcast live around the world), the BBC reported that Qin’s proposal was “an even bigger prize” for He. People immediately accused the BBC of furthering sexist norms that prioritize marriage over career achievements in a woman’s life. The “bigger prize” narrative showed up in other outlets, too. The Associated Press called He’s engagement ring an “even bigger prize” than her medal. NBC is promoting its video of the proposal with text that claims He’s second-place finish “wasn’t the top highlight” of her day. Anecdotal data from my own life suggests that most people who are married and/or have children will call their wedding days and/or children’s birthdays the greatest days of their lives. And for good reason! Romantic partners and children are commitments that affect every day of a person’s life. It’s easy to imagine someone not thinking about her Olympic medal for an entire day someday in the future; not so with her spouse or children. One would hope that a healthy society would value a commitment to a life partner at least as much as a major career accomplishment—in this case, a hunk of metal for diving really well. If NBC had tried to come up with all the great days of Kerri Walsh Jennings’ life but left out her marriage and children, people might have protested that Olympians are more than just their athletic performances. They’re complex people with rich personal lives! The issue here is the weird conceit: Why, unless Kerri Walsh Jennings had just published a gift book titled Kerri Walsh Jennings’ Great Days, would a TV network decide to compile a definitive list of the best days of her life? Even though marriage is objectively a pretty big deal in most married people’s lives, getting engaged is not the same as getting married, especially if He and Qin had been talking about putting rings on it for a while. (They’ve been dating for six years.) That makes the best thing ever lens of the BBC, the AP, and NBC a little more aggravating. Then again, calling Qin He’s “prize” is a nice inversion of the traditional way of talking about engagements. Historically, finding a husband has been portrayed as the ultimate accomplishment in a woman’s life (see: the MRS degree), but women have been cast as the prize (see: trophy wife). He Zi is clearly the achiever in this couple’s 2016 Olympic run: Qin only managed bronze in his diving event. Lucky for He, her man knows how to stand on a podium and look pretty.